The Yamaha FS1R is great featured synthesizer. Its oscillator section makes it on of the most powerful synths worldwide. The diagram below shows a simplified schematic of one FS1R voice architecture. The LFO and controls (keyboard scale, velocity, MIDI...) are not displayed. In any configuration, each oscillator (or operator) has its own VCA envelope, keyboard tracking settings, modulation and velocity settings. The waveform generation is so powerful that you can simulate the use of a filter, with one filter per oscillator and without using the real filter, keeping 32 note polyphony! The filter has resonance and can be configured as either low-pass (12dB, 18dB or 24dB), high-pass, band-pass or band reject. 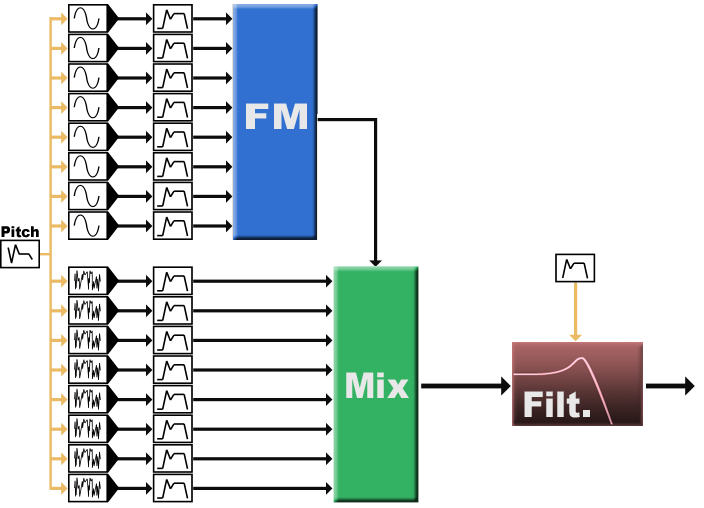 You also have 2 LFO where one is dedicated to the filter, a pitch envelope and morphing parameters for simultaenous real-time action on several parameters from a pot for example. The oscillator section is the most important section of the synth. There are two types of oscillators: voiced and unvoiced. The voiced operators are the most used. They generate notes following what is played on the keyboard, as usual. The unvoiced operators are more suited for noise generation and shaping. But you can set them as sine wave generators and use them like traditional oscillators. Unlike on a vintage synthesizer, the waveform is not just a selection in the list Square, Saw, Pulse, Sine. Here you first choose a type of waveform, then you shape the tone (the harmonic content) more precisely with several parameters depending on the chosen type. In the case of a sine wave, which is the simplest, there is no more tone parameter. On more complex waveform like the one used for formant synthesis, a frequency value is used which is independant from the played note. This may be the more complex point to understand to make the most of the synth power. The best is to just have a try, you will quickly hear what is there. An unvoiced operator is much like a voiced operator in formant mode. That's probably because they were made to work together. You will find almost the same parameter set but you just act on the harmonic content which is here applied to a noise (like a breath). The Frequency part is for the harmonic content, not for the base note of the sound (except for the sine wave). It includes tuning settings, keyboard tracking settings and an envelope for each oscillator. The main envelope and the KB scale modify the amplitude (the output volume) of the operator. You also have settings to modify bandwidth, frequency, pitch, amplitude or envelope gain values from the played note on the keyboard, the note velocity or the modulation from LFO1. FM synthesis is traditionally based on 2, 4 or 6 sine operators and a routing algorithm selection. Here you run with 8 freely shapable oscillators, and there are 88 algorithm to choose from. The potential in really huge! Depending on the chosen algorithm, one operator features a feedback loop. The output operators also have an dB attenuation (output gain setting) parameter. The filter with its dedicated envelope, the 2 LFO and the pitch envelope mostly look like what can be found on other synthesizer. The 'Formant Sequence' parameters define the sequence track routing to the 16 operators, grouped into 8 voiced/unvoiced pairs. Each operator can be independantly linked to the formant sequence. Two morphing groups named 'FM modifiers' and 'Formant modifiers' enable simultaneous action on several sound parameters from a pot for example. Each group is tied to a front panel encoder, but you can also use MIDI controls (set in the 'System' panel). The 'Performance' section combines up to 4 'Voices', to layer sounds or use them at the same time. What is noteworthy here is that you have settings to act on sound parameters. A single 'Voice' patch in ROM memory may sound differently depending on 'Performance' settings. The FS1R name comes from this feature (FS for "Formant Sequence", 1 for "1" et R for "Rack"). You just pick a sequence in the list and assign it to a 'voice' patch (like B115 for example) and the synth starts talking or singing! For now ZeeEdit-FS1R only handles ROM formant sequences. The configuration where the patch memory storage is divided by 2 allowing sequences to be stored in the device is not supported yet. But the variety of ROM sequences and the loop and shift features already allow great possibilities! This matrix assigns 14 controllers to up to 8 parameters simultaneously and independantly. You will need it for example to route the modulation wheel or aftertouch to pitch moulation. 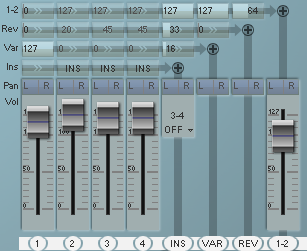 The mixer section features one input track for each of the 4 'Voice', one bus for each 3 effect unit and an output section. 4 effect units are available simultaneously. Their settings are saved within the 'Performance' patch. 'Insertion' is a general purpose FX processor. Each input can be routed to the insertion bus. The other FX sends are then disabled on the track, but the insertion bus has its own sends. 'Variation' is a general purpose FX processor. 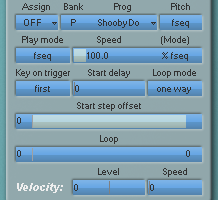 Each input track has a send to the variation bus. The insertion bus too. 'Reverb' is a reverb and delay processor. Each input track has a send to the reverb bus. The insertion and variation busses too. '3 band EQ' is a parametric equalizer on the output section. The insertion bus can be routed out to the physical outputs 3-4 of the device. As you can see, the FS1R has a huge potential. It becomes obvious that only a great editor can give you access it. This synth's complexity was probably a stumbling block to its success.